Yesterday my small apartment was brimming over with knitters and yarn. 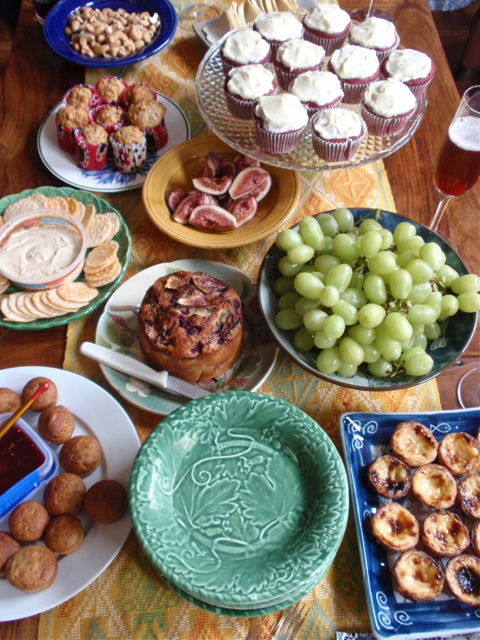 I used up every chair I own to accommodate the knitters and every flat space in the room - table, cabinet, and floor - to accommodate the yarn; except, that is, for the table needed for the food. 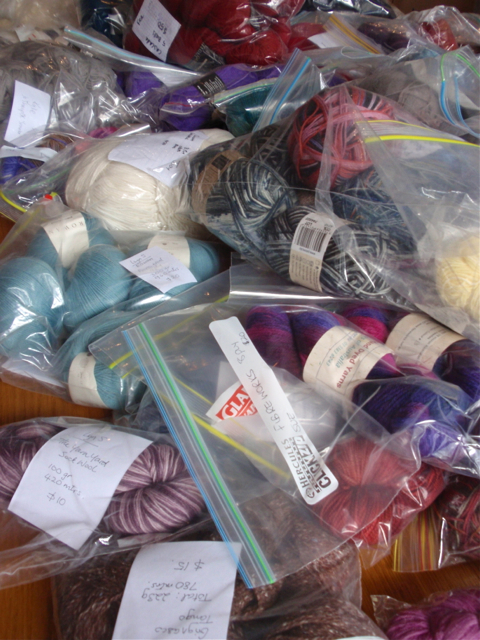 My local knitting group had decided to have a destash - supposedly an opportunity to find a new home for yarn you have decided you no longer want or need. Of course, to make this happen someone else has to acquire the yarn. This was a most spectacular display of yarn. Enough to open a yarn store immediately. I'm afraid I was one of the group who acquired more yarn than they discarded. But with yarn it's quality that counts, isn't it? and the yarn I acquired was lovely - some Madelinetosh sock yarn, some Wollmeise lace and some Oldmaidenaunt organic corriedale. There was chat and knitting and eating and laughter and forensic examination of all the yarn for sale. If you like knitting, an ideal afternoon. Most wonderfully of all, a knitting friend (who is also a crocheting friend) brought a gift for me. 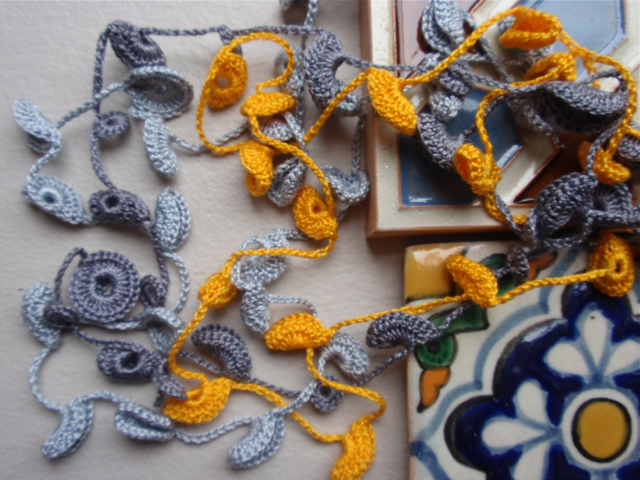 I'd admired some very elegant grey earrings she had crocheted for herself. Very generously, she had made me some crochet neckpieces. They're lovely. Two shades of grey and a rich yellow - designed to be worn all together. I feel very fortunate. One of the many reasons that knitting is such a great craft to practise is its portability. I've been travelling around a lot over the last month or so and have generally just been busy, so it's been great to have knitting that I can easily carry from place to place - provided, that is, that I've remembered to assemble needles and patterns and yarn that are largely compatible. I'm also appreciative of knitting's capacity to easily adapt to the circumstances I've found myself in. When I've wanted a challenge, or I've wanted to distract myself from even greater challenges in my everyday life I've been able to choose a detailed, complicated project. But if, as has recently been the case, life is busy and distracting, I've been able to take on small, repetitive, routine knitting projects. 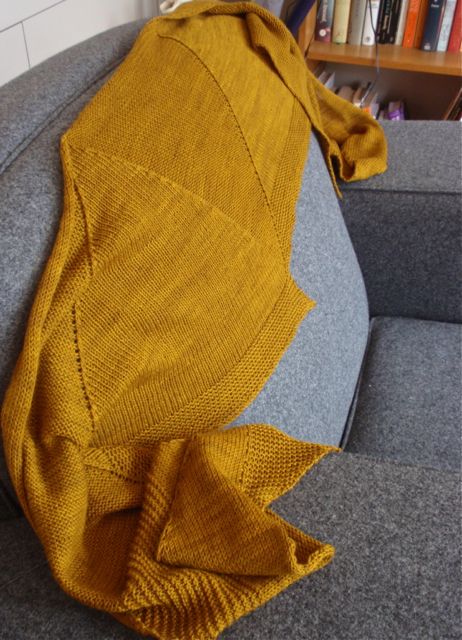 The scarf I knitted using Heidi Kirrmaier's Windward pattern has been perfect travel knitting. 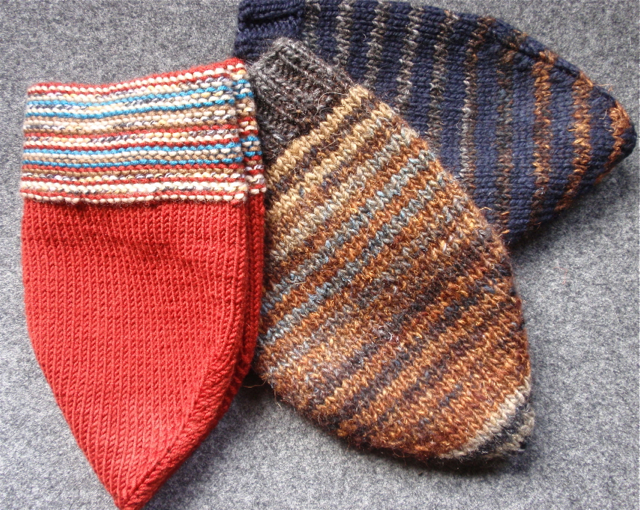 Lots of stocking and reverse stocking stitch; a bit of garter stitch, and regular increases and decreases. A well-written pattern. A project that was very easy to put down and take up without losing my place - though I did use the added prompts of a row counter and stitch marker to mark the right side of the work. What's been a added bonus is that I'm very happy with the outcome. It's had lots of outings, and lots of compliments already. It's a very modern scarf with with its asymmetry and its reliance on texture, rather than stitch patterning for its interest. 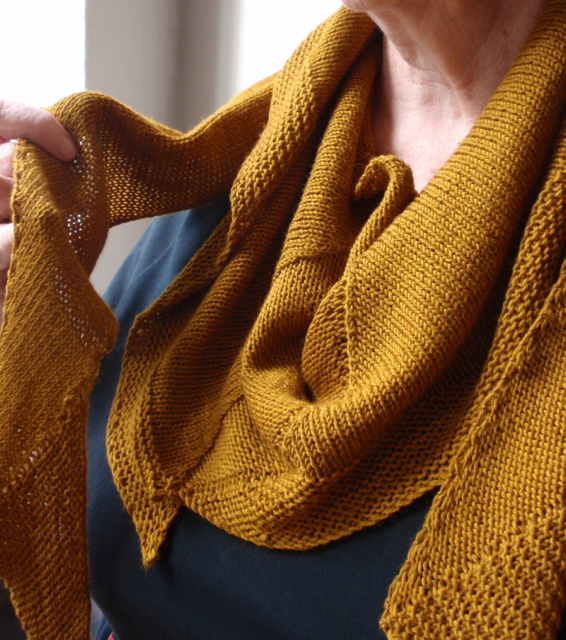 It's the kind of simple, structural design that perfectly showcases the intense, saturated colours of Wollmeise yarn. I wouldn't usually choose to wear mustard yellow. But I think this colour is so wonderful that you just decide to wear it anyway, regardless of whether it suits you. 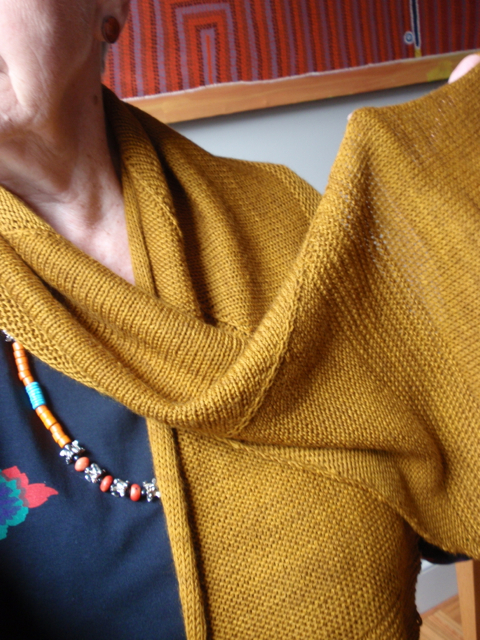 The yarn also produced an ideal drape for this scarf that makes it just so easy to wear. Altogether a very successful project - both the process and the product. 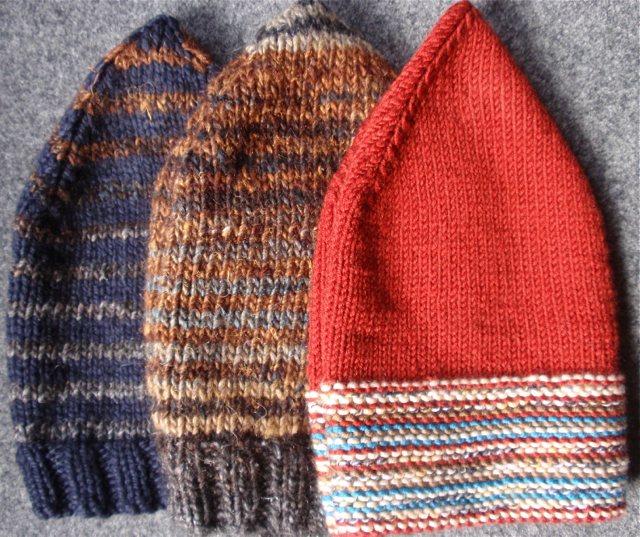 I've also been knitting some hats during these last busy, disrupted weeks. I've been using perfect, simple, easily trackable patterns (Brooklyntweed's Turn a Square and Mustavillaa's Garter Stripe Beanie) that are both portable and adaptable. They were also ideal for using small amounts of yarn I already had in my collection. One of my knitting friends annually collects knitted warm hats to be distributed in winter to homeless people in Sydney who are served by a mobile soup kitchen. The hats are for this purpose. I suspect I've written before about my approach to 'charity knitting'. Actually, the very adjective 'charity' makes me feel quite uncomfortable. I have a deep commitment to an egalitarian society where there is ready access for all citizens to the necessities of life. But I don't want to achieve this goal through a mechanism of kindness on one side and expected gratitude on the other. So, I've set myself some rules for such knitting. The first is that there's no particular virtue in 'charity' knitting. I'm doing it mainly because the knitting gives me pleasure. If it benefits someone else that's an added benefit. There's no expectation of gratitude. The second rule is that I like to have a reasonably direct link between the knitting and the person who receives it. I'm not sure that this is a very justifiable rule, but it's good to think the item can be easily and cheaply distributed and used. And thirdly, I'll only knit something 'for charity' that I'd be happy to wear myself or give as a gift to friends or family. Consequently, I like to use good yarn and attractive, modern patterns that the recipients might be happy to choose to wear. Like my scarf, the hats have been perfect projects for the last few weeks. 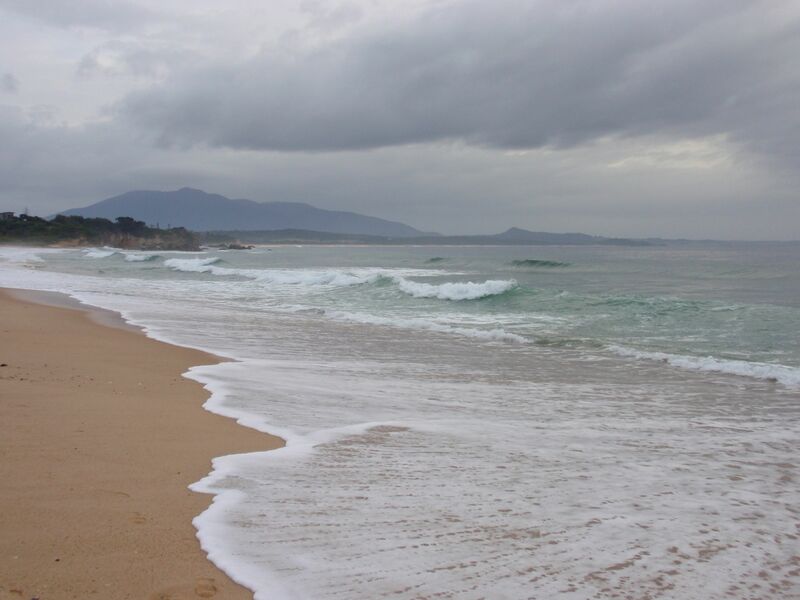 Over the Easter break I've again been to Bermagui on the far south coast of New South Wales for the biennial Four Winds Festival. Bliss. Two whole days of sitting in a most beautiful outdoor amphitheatre, in perfect weather, listening to music that was variously challenging, meditative, amusing, exciting, nostalgic, and capable of producing almost any other (pleasant) emotion you could possibly imagine. I've written before about Four Winds and commented that it's a wonderful and extraordinarily well-kept secret. Well, no longer. The 2012 festival reached its capacity - around 1,500 people - so if you ever want to attend future festivals you need to get in early. 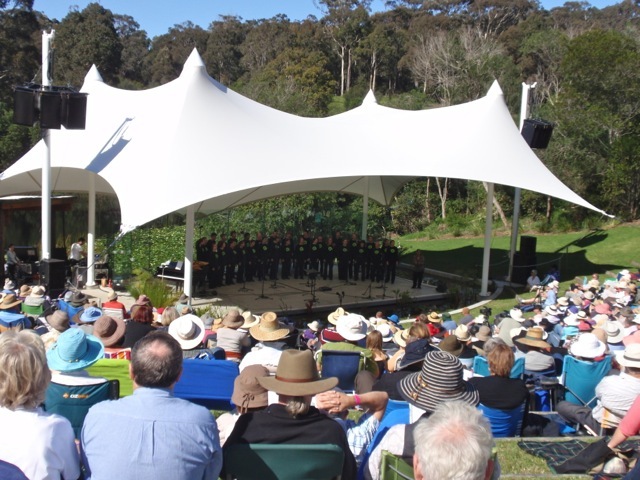 This year the festival had a new, soaring, sound stage, designed by well-known architect Phillip Cox who is a long-time supporter of the festival. The acoustics of the amphitheatre have always been good, but they're now excellent. The festival's artistic director, recorder virtuoso Genevieve Lacey, had put together an amazingly innovative program. 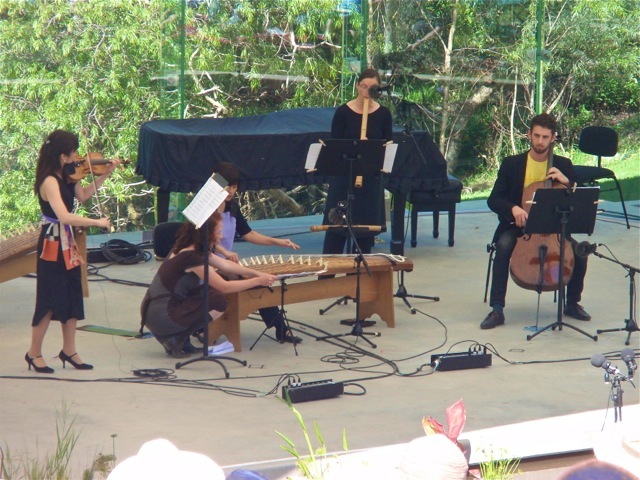 There were were many new Australian compositions, many unexpected combinations of instruments, and a number of rearrangements of well-known pieces of music. Among my favourites were a grouping of pieces titled oriental pictures that contained some Chinese classics as well as Mussorgsky's Pictures at an Exhibition arranged for violin, cello, shakahachi and koto, and a rearrangement of Bach's Goldberg Variations (probably my favourite piece of music ever, if one can have such a thing) for two pianos. I also loved the playing of Scots classical accordianist James Crabb who, as well as playing some Piazzolla tangos I loved, played some Scottish folk airs accompanied by Genevieve Lacey on recorder. If this all sounds a bit gimmicky, it wasn't. All the musicians were masterly, and you could tell they enjoyed the broad and free contexts for music making that the festival provided. I stayed with old friends for the weekend and so the festival program was surrounded by lots of discussion about the music and general chat and shared meals and wine and by a little sight-seeing and touristing. 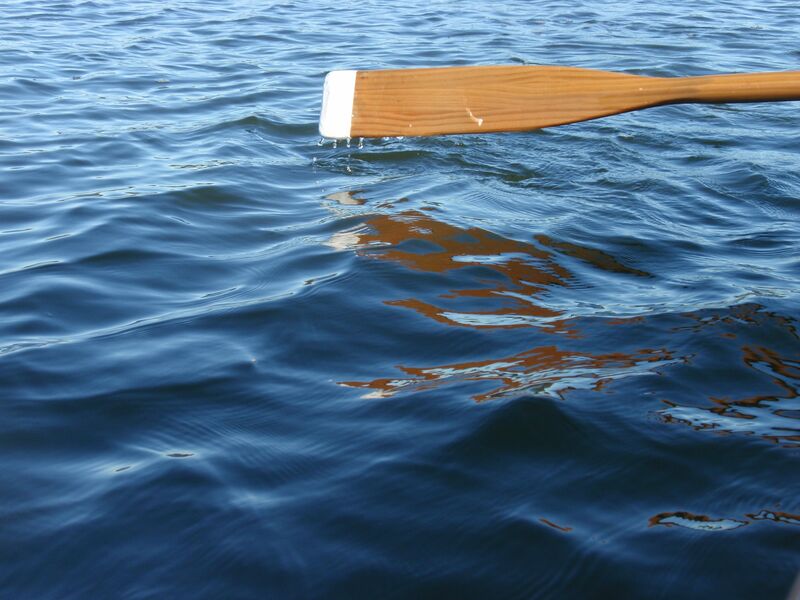 The festival included a whimsical soundscape as an adjunt to the music program - the seagull: a sound vessel. 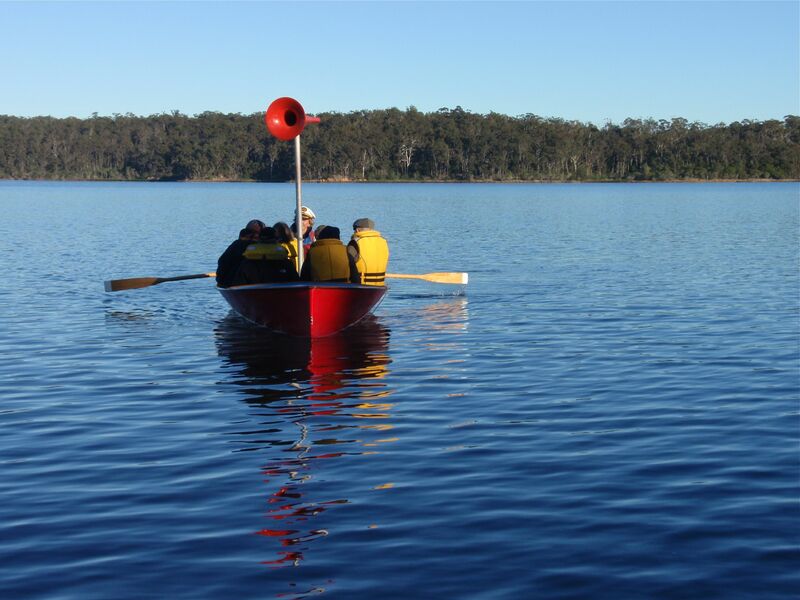 We boarded the seagull - a small boat - at about 7.00 one chilly morning and were rowed into Wallaga Lake. 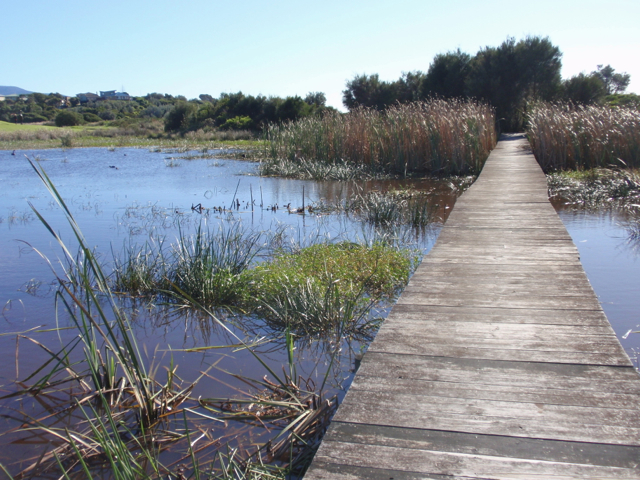 As we sat in the boat, surrounded by the lake awakening to its daily life and the sounds and sights of the busy birdlife, we listened to tales of the area and its sounds. It was a magical half hour. 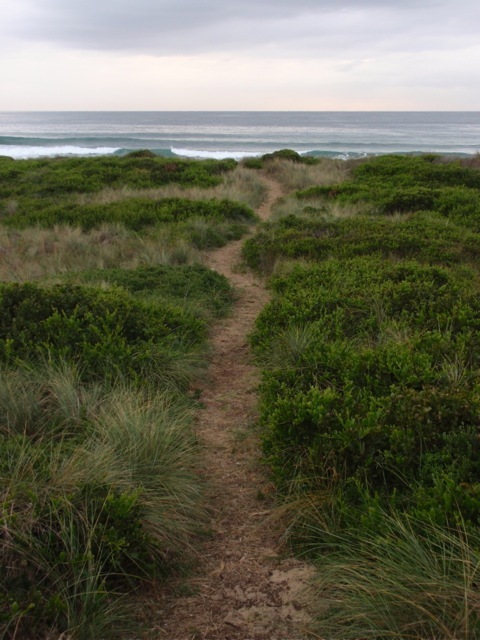 We also visited Tathra, further south from Bermagui and, before roads south were built, a major port for the south coast area of New South Wales. 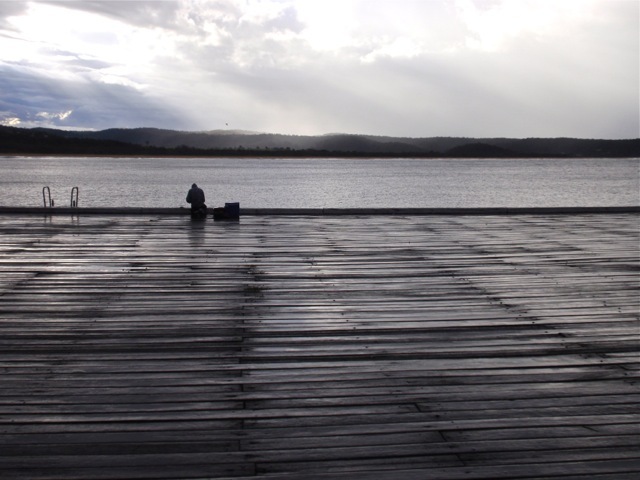 The Tathra Wharf, built in 1862, has been classified by the National Trust. 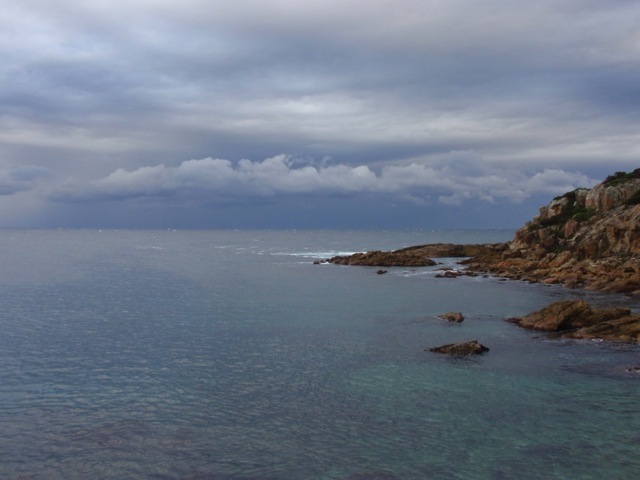 As we drank coffee and ate delicious cake at a cafe that opens to a stunning view of the wharf and surrounds, a dramatic storm blew up from the south. 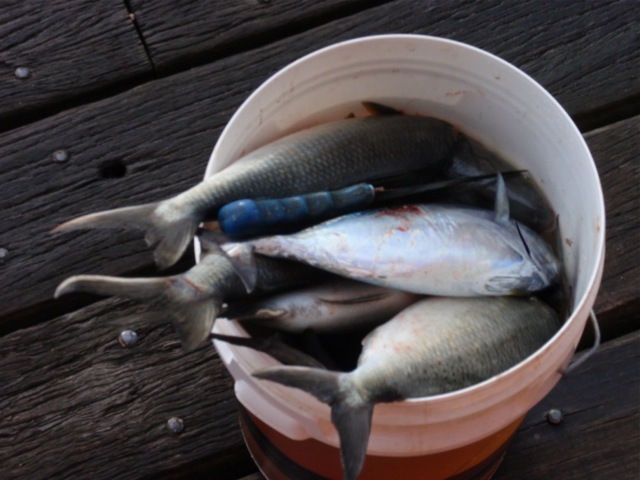 Apparently this signalled good fishing weather because in the time it took to drink our coffee and eat our cake the wharf was filled with fisherfolk. and I can't wait till Easter 2014 and whatever the next Four Winds brings. All right. I admit it. Not buying books is MUCH harder than not buying clothes. I'm trying very hard not to buy books. Every time I even begin to think about buying a book I restrain myself. Even so, this month I bought three books, so that I'm halfway through my year's quota after only three months. But I think I had such good reasons for buying these books. Their purchase was unavoidable. However, I expect I will feel that way, for new and unexpected reasons, about every book I buy this year. 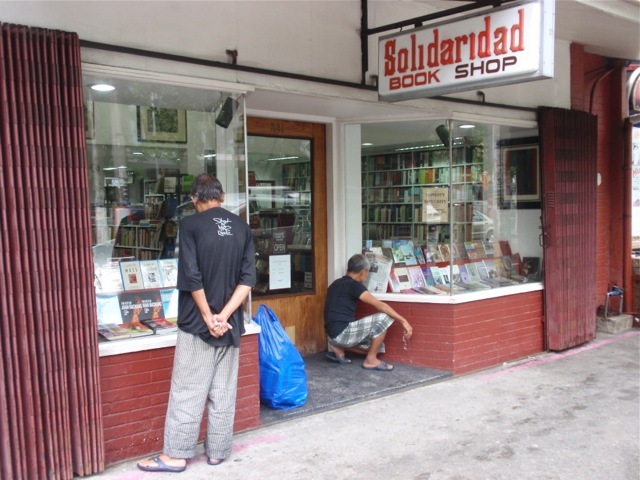 While I was in Manila I visited Solidaridad bookshop. The bookshop opened in the mid-60s and has always been owned by renowned Filipino novelist, publisher and commentator F Sionil Jose. 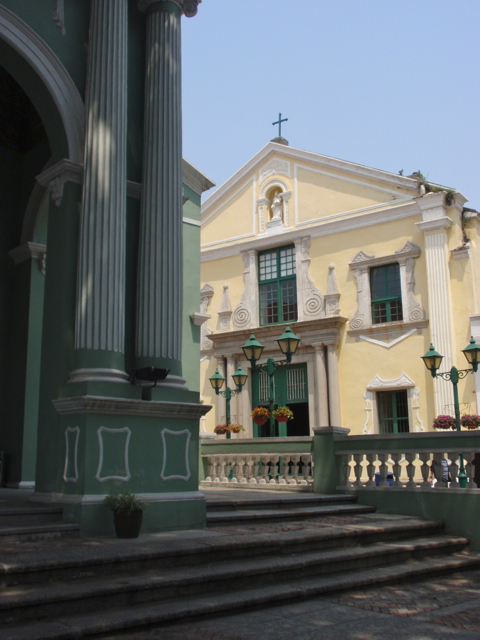 It's located in Ermita which is one of the old bayside areas of Manila. In the seventies, when I first visited the bookshop, Ermita had already passed its period of grandeur, but still had some interest as a rather bohemian place where writers, academics, political activists and journalists congregated. The centre of Manila has moved westward since then and Ermita is now very tatty and down at heel. But the bookshop somehow survives. It still stocks an interesting selection of literature and, in particular, a good range of Filipino literature. Even though English is widely spoken in the Philippines, and journalism and comment in English is robust and widespread, few novels are written - either in English or local languages. F Sionil Jose has been the most prolific Filipino novelist in English, writing novels in a realist tradition that deal with issues of family, of class, of identity and of dislocation. I've read a number of his works over the years and so when I discovered a new 2011 publication, The Feet of Juan Bacnang, I couldn't resist purchasing it. It was the perfect place to buy a copy. The second purchase was equally meant to be. 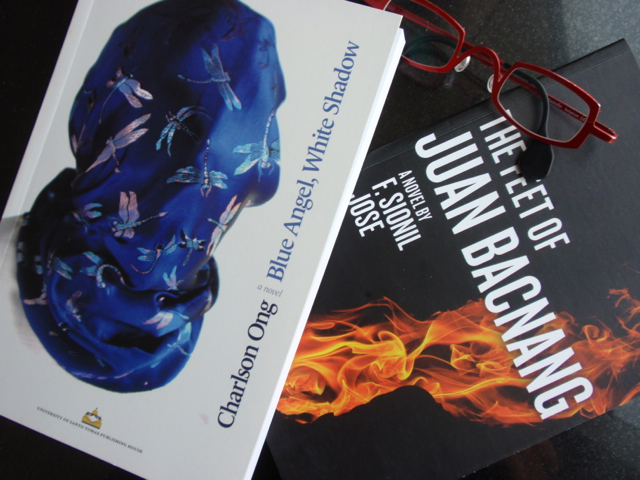 I bought a detective novel - Charlson Ong's Blue Angel, White Shadow. Given the relative scarcity of Filipino novels in English, and my liking for detective fiction, this also was irresistible. The third purchase? Well, if you ever plan to travel to Macao and you're as addicted to reading as I am, make sure you travel with a good supply of books. 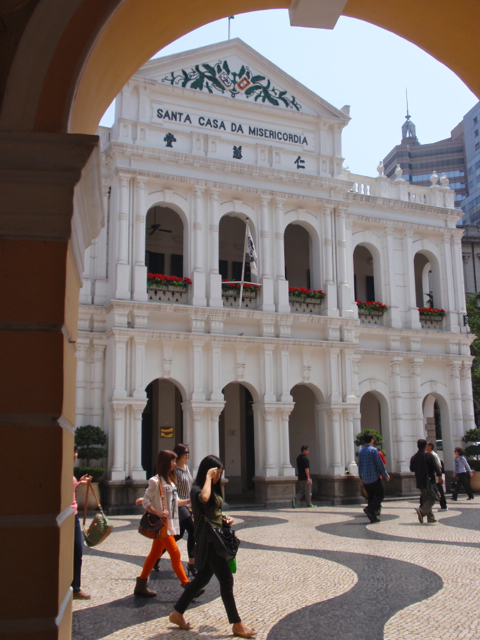 I finished the single book I'd taken with me soon after I arrived in Macao and went searching for a bookshop. I'm sure the concierge at my hotel had been asked for many things in his job, but someone seeking directions to a bookshop was clearly well outside his experience. I could easily have found Rolex watches or Parisian couture clothes, but books were much rarer. Eventually I stumbled on a Portuguese bookshop with a small but interesting selection of books in English where I bought a copy of Andrew McGahan's 2006 novel, Underground. It's not one of McGahen's best works (I was very impressed by Last Drinks, set in the era of the Fitzgerald enquiry into police corruption in Queensland) but it's an interesting political comment on the dangers of repressive political leadership in Australia in a post 9/11 world. So, buying all three books was either irresistible or unavoidable. But I do have to count them in my year's total. I'm coming to the conclusion that I set an impossibly low target for the year. The 'mmm' in the title of this post is the kind of 'mmm' you make when you can't make up your mind what you think about something. 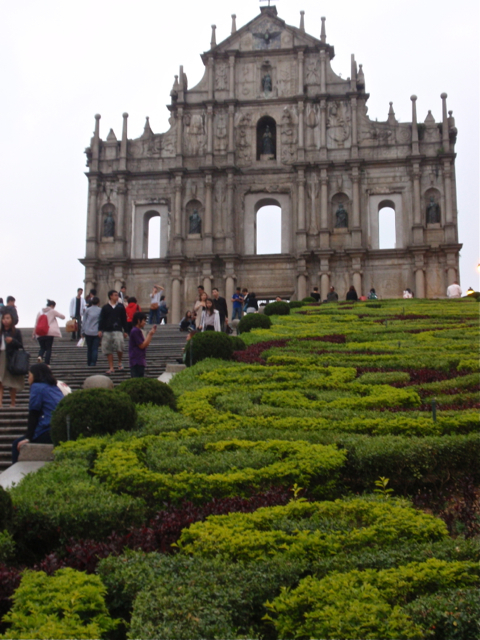 I've just spent a couple of days in Macao and it has me a bit flummoxed. It was a most interesting visit - challenging and a bit confronting.I think it says something significant about the blending of local and global cultures - but I'm not sure what the 'something' it says, is. 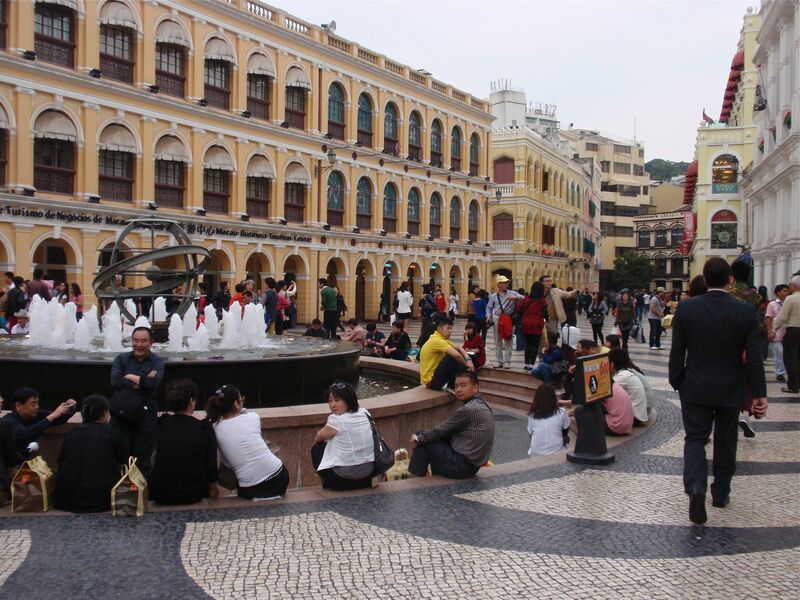 I first visited Macao around forty years ago when it was a sleepy remnant of the once great Portuguese colonial empire. 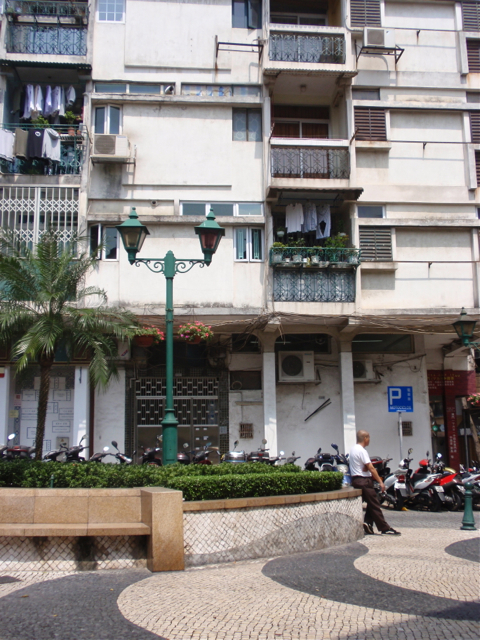 My vague memories are of a lovely walkway around the bay - shaded by ancient trees, a few rather decrepit colonial style buildings, and twisting streets of dark and crowded Chinese tenements. Rather daringly, we stayed in the then bran-new Lisboa hotel where Macao's first casino had recently opened. 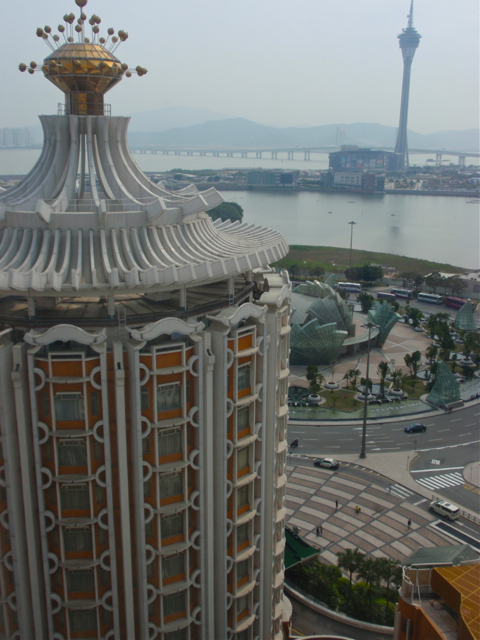 Forty years on most of the bay has been reclaimed for landfill, there are high-rise buildings everywhere and glitzy 'themed' casinos abound. I decided, partly for old times sake, to stay in the Lisboa hotel again. The other part of the reason was that the Lisboa is within easy walking distance of the old town centre, whereas many of the newer hotels, particularly those with casino attached, are out of town and seem to assume you will spend all your time within the hotel or resort itself. So, even though I wasn't staying in a modern version of a Venetian Palace or the Eqyptian Sphinx, the Lisboa had lots of old-fashioned glitz. Every surface was gold-leafed or marbled or made up of glittery mosaics. There were ostentatious displays of monumental carved jade or precious wood statues and more money-changers, pawn shops and sellers of extremely high-end luxury goods than I could ever imagine to be assembled in one place. 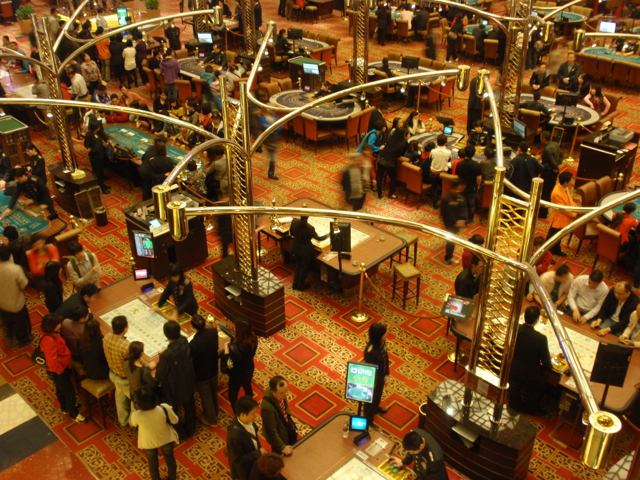 It's clear that most visitors to today's Macao come for the gambling. There are frequent, packed ferries from Hong Kong and busloads of tourists from China. 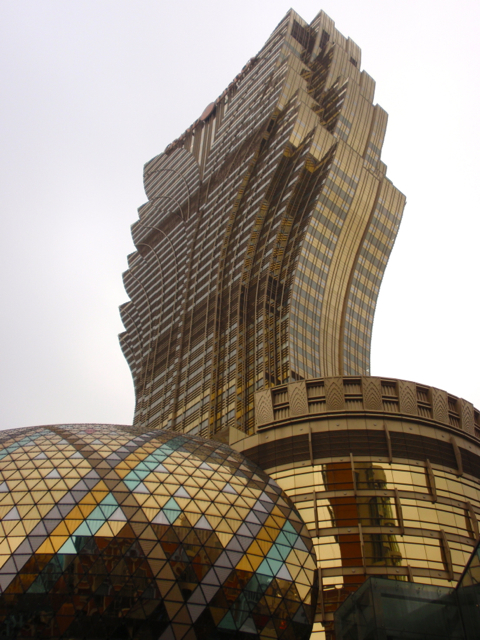 I discovered that the shortest route from my hotel to the old town centre was (very oddly) via one of the gambling halls of the Grand Lisboa casino. This is what it looked like at 9.00am. And at lunch-time and in the evenings it was jam-packed. I think I'd imagined desperate, grim faces around the tables, but on the contrary, most people seemed to be enjoying themselves and were noisy and convivial. I'm sure there were dreadful, hard-luck stories (to which the prevalence of pawn-shops attest), but many of the people had more the appearance of groups of friends having a day out. At night the whole edifice is outlined in neon and the globe at the front of the building has changing patterns of lights. I can't begin to imagine the electricity consumption of some of these buildings. The architecture is so garish and exuberant that I began to wonder whether there isn't a different aesthetic from the one I normally use to judge buildings that enables such structures to be designed. 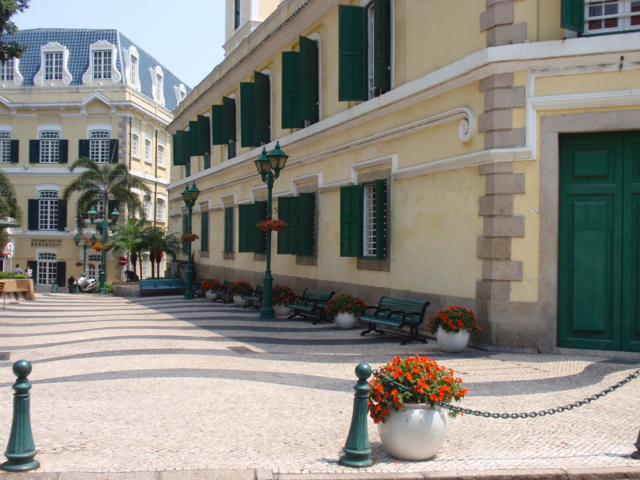 But if you leave the casinos and hotels you can find the old town centre with its elegant colonial Portuguese buildings. These buildings, that were crumbling away on my visit forty years ago, have been restored and are now resplendent in their gelato colours. The public squares and footpaths have been paved with cobbles in wavy patterns and recurring maritime motifs. In the evenings the squares and pedestrian streets are crowded with people whom I assume are locals. It's all quite different from the casino and hotel scene. 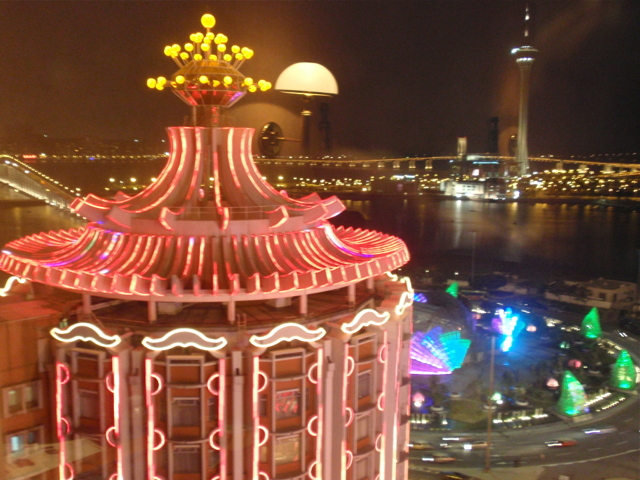 Macao jostles the everyday with the colonial past and the reckless glitz of modern gambling. You can see why I have difficulty deciding what to think and feel about it. 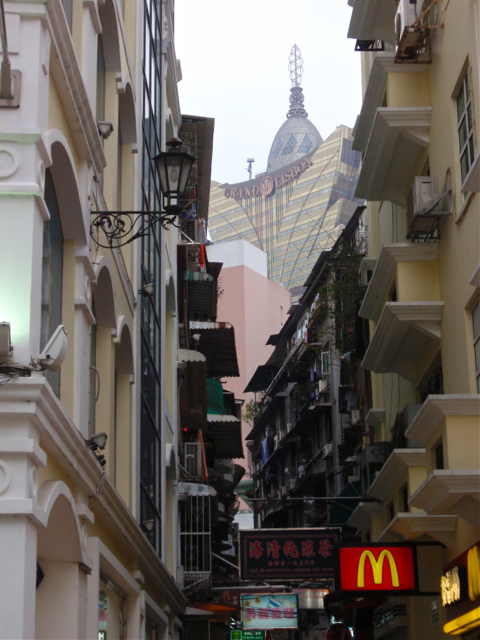 I think this photo sums up all the contrasts - colonial buildings (housing McDonalds) leading to a narrow street of tenements and framing in the distance the bizarre architecture of the Grand Lisboa casino.